Rescue workers prepare to pull up Chilean miners trapped underground for 69 days using a capsule that incorporated suggestions from NASA (Credits: Alex Ibanez/AP). Mine Shield LLC, a Kentucky based company, has recently acquired life saving technologies from Paragon Space Development Corporation that were originally developed to purify air for astronauts travelling to and from low Earth orbit. The air purifier is being implemented in Mine Shield’s Guardian Refuge Chamber, which can provide physical shelter as well as food and water rations for up to 96 hours for miners trapped underground. In 2010, NASA invested $1.5 million into Paragon Space Development Corporation to mature an air purification system for the Commercial Crew Development Program. The Mine Shield “Guardian Refuge Chamber” (Credits: Paragon SDC). As well as the space-derived CO2 scrubbing system, the Guardian Refuge Chamber offers the following additional levels of protection: a communication system that acts as a lifeline to the surface, a gas monitoring system, airtight doors, a chemical toilet, a gas purge system, and a reinforced steel structure to protect the miners from blasts and debris. Optional extras include SMS text communications, cooling systems, and a wireless tracking system to aid rapid recovery of the trapped miners. Mining accidents are unfortunately commonplace, with the majority occurring in China. 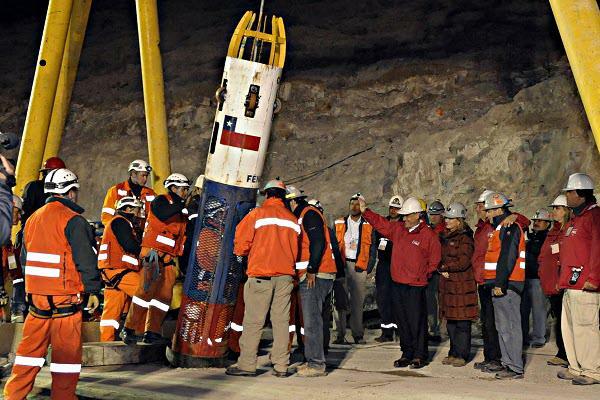 NASA earned accolades for its role in assisting with the rescue of 33 Chileans stuck in a copper mine for 69 days in 2010. From diet suggestions to recommendations for the rescue capsule design that ultimately brought the miners to the surface, the incident highlighted the similarities between space travel and extended underground habitation. Paragon SDC has announced that it plans to adapt similar life-support technologies for the Excalibur Almaz spacecraft as well as the Golden Spike company’s Moon vehicle, and on January 8th 2013 announced that it has become an executive member of the Commercial Spaceflight Federation.